Provide comfort for the family of Nancy Fortier with a meaningful gesture of sympathy. 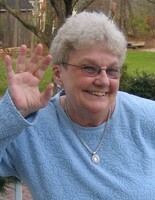 Nancy M. (Barber) Fortier, 78, passed away peacefully on Wednesday, April 10, 2019 at home surrounded by family. Born in Meriden on August 15, 1940, she was the daughter of the late Roland and Constance (LePage) Barber. Nancy was a lifelong Meriden resident and had graduated from Meriden High School. She was employed by SNET. She was a member of the We The People Party. Nancy was a wonderful mother, having devoted her life to raising her five children. Friends and relatives are invited to attend a funeral service to be held on Monday, April 15, 2019 at 7 p.m. at the John J. Ferry & Sons Funeral Home, 88 East Main Street, Meriden. Burial will be private. Family and friends may call prior to the service on Monday from 4 to 7 p.m. In lieu of flowers, contributions in her memory may be made to a charity of one’s choice. To plant a memorial tree in honor of Nancy M Fortier (Barber), please visit our Heartfelt Sympathies Store. No more sorrow, no more pain, only peace, love and joy. This is the promise for those who love God. Nancy, I know you are in heaven with Jesus. I know you are safely in God's care. We will all miss you. Lori Williams. Paul & Family, My thoughts & prayers are with you during this difficult time in your lives.